"A twenty-year-old kid founds his own business just to prove he can, and eight years later finds himself the leader of a business valued at $100 billion. It is an improbable story - one that could happen only in the United States … that is the magic of the U.S. financial sector, which is now being so widely criticized. 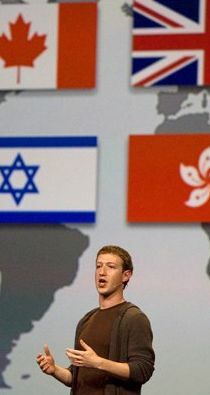 … "
The $100 billion man: Facebook Founder Mark Zuckerberg is living every 21st century entreprenuer's dream. It is an improbable story - one that could happen only in the United States. That of a twenty-year-old kid who in 2004 founded his own business just to prove he can, and eight years later finds himself the leader of a business valued at $100 billion. One hundred billion dollars is as much as McDonald's and two and a half times that of General Motors. All this for a sophomoric prank that today employs no more than 3,000 people. That is the magic of the U.S. financial sector, which is now being so widely criticized. 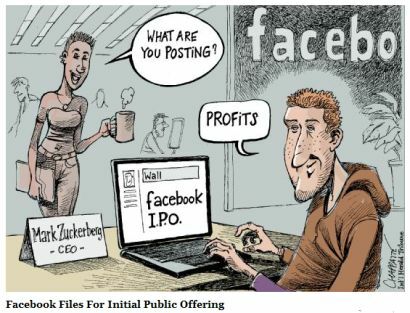 To all those who think that the stock market serves only to accommodate rapacious speculators who enrich themselves while asleep, getting richer whether the market rises or falls, the Facebook story is a reminder of the two basics of investing: the long-term and risk. The long-term, because the value attributed to Facebook, the profits of which are minimal but the cost of doing business for which is still modest, is an anticipation of future performance. It is the idea that this company, which has quadrupled its revenues in two years, can in a single decade become a giant worth tens of billion of dollars. Which is precisely the gamble Amazon's stockholders have made over the last ten years, and who are concerned about its weak returns but fascinated by the explosion in sales. For Facebook, as for Amazon and Google, growth potential seems unlimited. But $100 billion is also the price of risk. To get that one Google, how many AOLs, Yahoos, Netscapes or Altavistas have fallen on the field of honor of that great state fair that is the Internet? Before Facebook, MySpace had deceived the world; it was purchased for $500 million and resold for $30 million. Facebook is already exceptional, and not just because of its founder's Hollywood-style success. ... Like Google, Facebook wasn't the first in its field, but was the first to master the rules. The first is to focus on the long term before the short and to extend its network as much as possible before drawing money from it. This year, one billion people are expected to use the network. It has become the most accessed site on the planet, and above all, the leading medium of the 21st century. We go there to be informed, share our travel photos, talk to our cousin on the other side of the earth, or arrange a meeting an hour from now. Facebook is a universe of its own and has several satellite businesses, which - like U.S. company Zynga - have already gone public. That is what Wall Street is buying: the power of an unknown person to change the world.